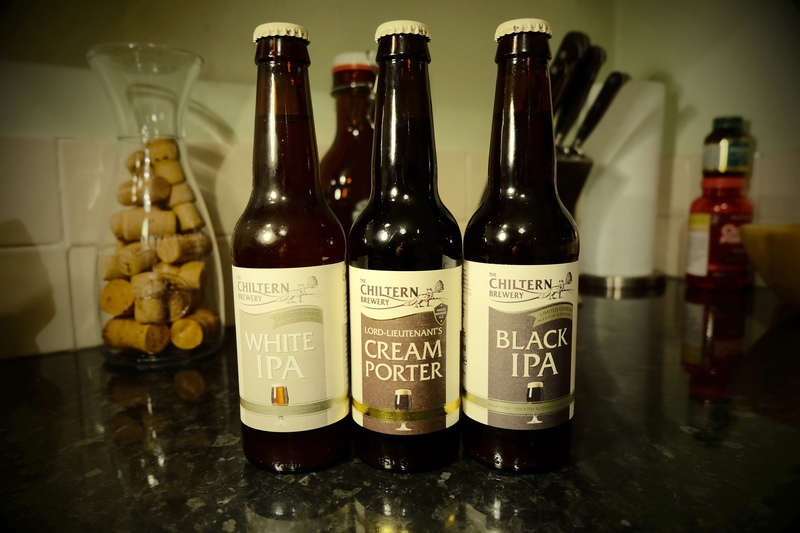 tradition and craft – MostlyAboutBeer……..
Over the weekend, I noticed that Chiltern Brewery had a stall in the Sunday market with a couple of beers I’ve been aware of but never tried: their Black IPA and White IPA. I’ve always been a fan of their cask beer but it’s rarely seen in St Albans despite the brewery being considered “local” in a broad sense. En route to visiting my parents, Chiltern Brewery is somewhere I occasionally haunt. I go on a small detour off the M4 into the Buckinghamshire landscape to pick up some bottles or fresh beer. The countryside motif replete with fox appeals to the British fetish for bucolic nostalgia but in Chiltern’s case, it’s simply a point of fact: it’s very rural, very traditional and it’s situated on an old working farm so it’s a badge it can wear without being contrived. 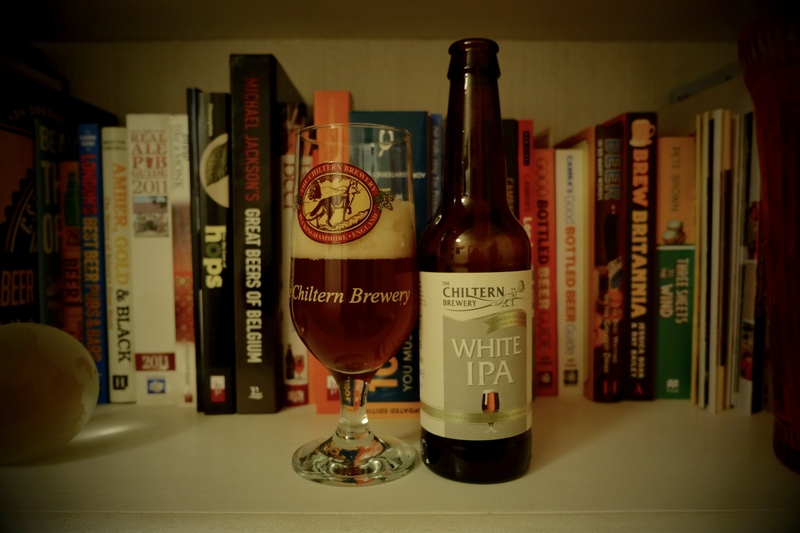 Chiltern Brewery was founded in 1980 making it a really old new trad brewery or a very young old one. Here though, a traditional brewery gets craft right. There are no skulls, no living dead mammals, no split personality, no psychosis. Just well crafted beer. The Black IPA (bottle conditioned 7.8) pours a dark tan with a fluffy beige head and lilts of earthy British hops. There’s less of the Opal Fruit fluorescent green coming through on the aroma compared to other Black IPAs. It’s more grassy and finishes dry. I was most looking forward to the Black IPA as I love the style, but it’s actually the White IPA I enjoyed the most. The White IPA (bottle conditioned 7.5) is so-called because Marris Otter and wheat have both been used in the grain bill. Despite the name, it actually pours darker than most IPAs. It racks up a big nougat head. Its bouquet is of candied oranges. There’s a musty ashen note too. Drinking it reminds me of red hedgerow berries and Braemar apples – just the fruity sweetness – there’s no tartness here. It’s an English fruit sponge take on a double-strength IPA. The thing that these two ales share is that they completely conceal the alcohol; it doesn’t come through on the taste or nose. They’re both full-bodied but could pass as session beers. Both IPAs were matured for 18 months which helps smooth them out too. Some of the writing on the bottles explains the thinking behind Chiltern’s releases. 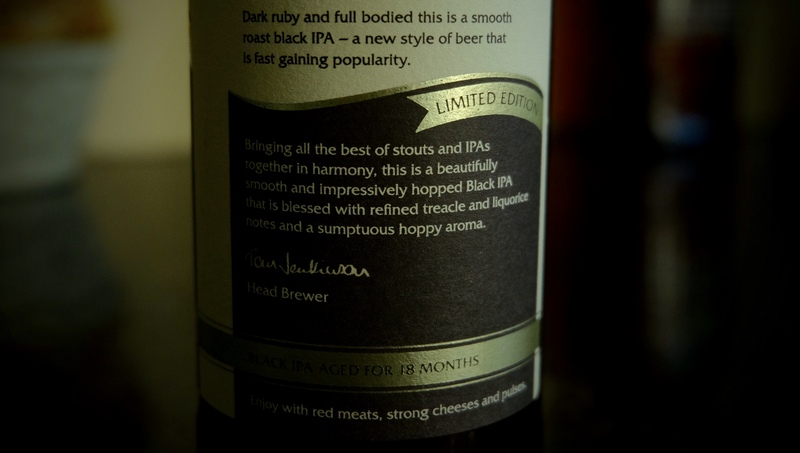 This for the Black IPA: “dark ruby and full bodied this is a smooth roast black IPA – a new style of beer that is fast gaining popularity”. I like it. It’s straightforward, honest and unpatronising. In the smaller bottle range, Chiltern also have their fulsome Lord Lieutenant’s Porter (6 abv) and their longstanding Bodgers Barley Wine (8.5 abv) – a beer I’ve had many times. It’s an unctuous sweet ale like liquid macadamia nuts – perfect for ageing. 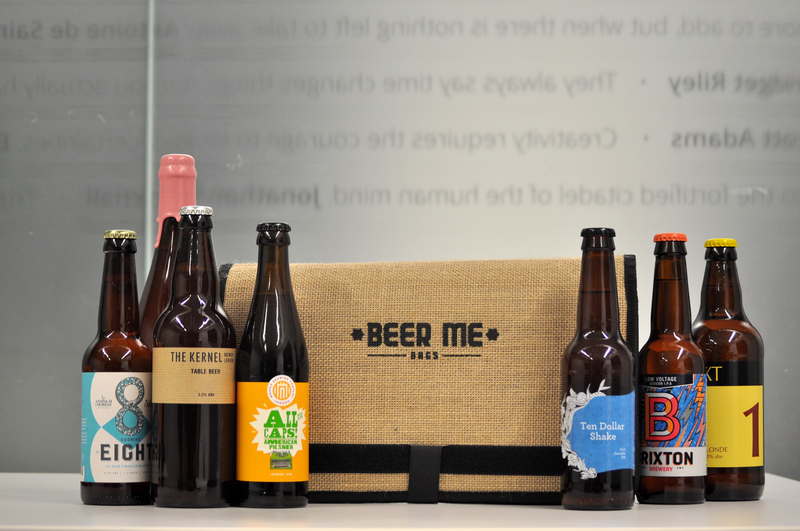 All these beers are in 330ml bottles which makes perfect sense for the more boozy sipping beers they all are. So they fit in neatly with other craft brands. When it comes to diversifying into new beer styles from the craft cannon, traditional breweries can be a bit like a dad trying to dance at a party – Batemans or Marstons come to mind. They can also implode into a steam punk schizophrenia whereby they change their name and identity, get tats done and invest in piercings. You know the ones I mean. Maybe it’s a form of mid-life crisis. Here is a photo of a pump clip I took a while back. 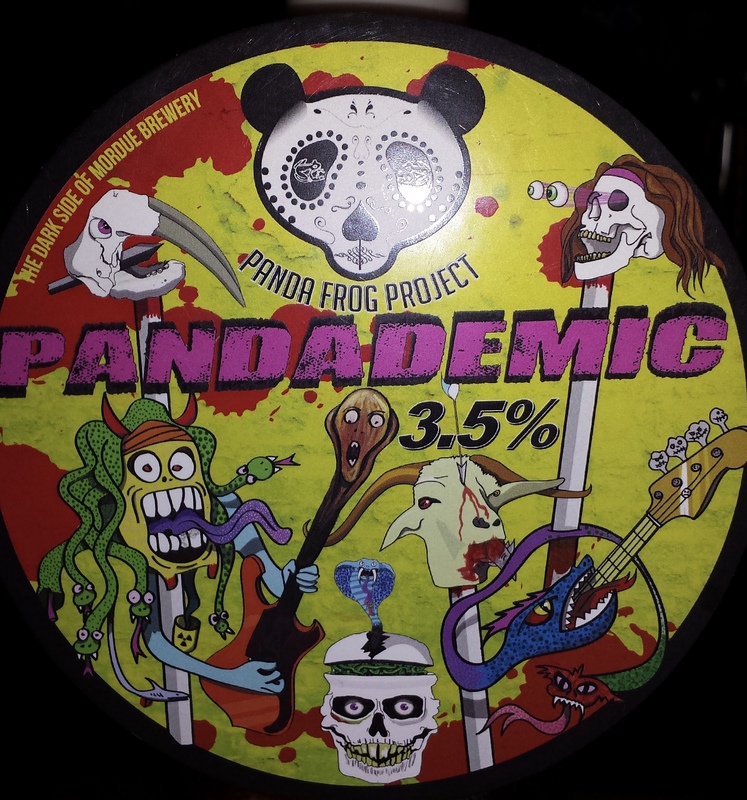 This brewery is actually Northumberland’s Mordue Brewery but as you can see, it’s taken on an alter ego: The Panda Frog Project. I did have a pint of this but can’t remember much other than it was quite hoppy. I’ve got nothing against the lively artwork I’m just puzzled by it. I can’t reconcile a pale beer with the nightmare scenario depicted. It didn’t make me hallucinate any more than a bitter or a stout would. So what exactly makes it insane? And that’s my point. I think breweries are feeling compelled to follow this vogue. These two new beers by Chiltern haven’t required that the brewery go on an acid trip to release them. What comes across is simply a brewery confident in its own brewing ability releasing a couple of limited edition beers. You know whose fault it is? Those same bottle shops you were praising the other day. Noone can drink 200-odd bottles, so people will always need a reason to choose your bottle over another. It’s more than just the need to stand out on a shelf. Design cues act as a kind of referral system – “You may not have heard of us, but if you like X then you’ll like our beer too”. The tick mentality and seasonal brews also mitigate against individual beers becoming brands like in normal marketing, although some breweries have become brands in their own right. Hence the emphasis on packaging. To be fair most of this kind of stuff comes from established breweries trying to out-craft their perception of craft (qv Robinsons Beardo), you don’t see it from say Brewdog, Freedom or Cloudwater for example. Interesting points but I’m not sure that I follow. If I take the beer shop in St Albans, Pope’s Yard, Chiltern, Tring, Chorlton, Thornbridge and Beavertown all stand next to each other on the shelf. The branding is completely varied. My point was just that the hellfire, dead animals & skulls seems to be something new and established breweries feel inclined to use to push beers that aren’t from the trad bitter/stout cannon. Chiltern simply proves that’s not necessary.You can just keep your original badge.